Welcome to John Worley Memorials. We are one of the foremost suppliers of monumental masonry in the Dacorum area. An independent, family owned and run company, we believe in offering quality products at affordable prices. "The bitterness of poor quality remains after the sweetness of cheap prices is gone." 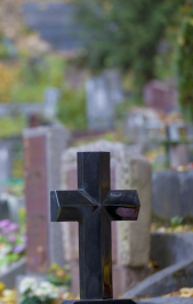 A memorial stone for a grave or cremated remains plot is a personal and lasting tribute to a loved one. On our site you will find catalogues for some of the types of stone we supply, sample inscriptions and motifs that can be applied, and examples of the different lettering that can be used. Take your time, look around and feel free to contact us to ask any questions you may have while making your selection. A memorial will last longer than a lifetime, and we want you to be completely happy with the choices you make. Regulations regarding memorial stones will vary from place to place. We can advise you on the stones which are suitable for your location. You should always make sure that your stonemason is registered and accredited by the relevant professional bodies and is working to local regulations and standard. We guarantee our work in accordance with all local regulations. Copyright © 2013 John Worley Memorials Ltd. All Rights Reserved.